A sari or saree is the traditional female garment in India, Bangladesh, Nepal, and Sri Lanka. A sari is a very long strip of unstitched cloth, ranging from four to nine meters in length, which can be draped in various styles. The most common style is for the sari to be wrapped around the waist, with one end then draped over the shoulder baring the midriff. The history of Indian clothing traces the sari back to the Indus valley civilization, which flourished from 2800-1800 B.C.E. 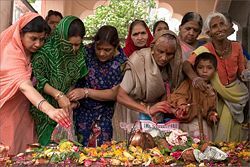 It is generally accepted that wrapped sari-like garments, shawls, and veils have been worn by Indian women in their current form for hundreds of years. Saris are woven with one plain end (the end that is concealed inside the wrap), two long decorative borders running the length of the sari, and a one- to three- foot section at the other end which continues and elaborates the length-wise decoration. This end is called the pallu; it is the part thrown over the shoulder in the Nivi style of draping. 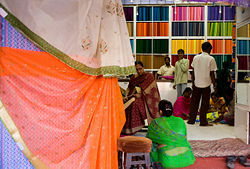 In past times, all saris were hand woven of silk or cotton, and represented a considerable investment of time or money. Sometimes warp and weft threads were tie-dyed and then woven, creating ikat patterns, or threads of different colors were woven into the base fabric in patterns; an ornamented border, an elaborate pallu, and often, small repeated accents were woven in the cloth itself. For fancy saris, these patterns could be woven with gold or silver thread (zari work). Sometimes the saris were further decorated, after weaving, with various sorts of embroidery, pearls and precious stones. Modern saris are increasingly woven on mechanical looms and made of artificial fibers, but hand-woven saris are still popular for weddings and other grand social occasions. A sari or saree is the traditional female garment in India, Bangladesh, Nepal, and Sri Lanka. A sari is a very long strip of unstitched cloth, ranging from four to nine meters in length, which can be draped in various styles. The most common style is for the sari to be wrapped around the waist, with one end then draped over the shoulder baring the midriff. The sari is usually worn over a petticoat (pavada/pavadai in the south, and shaya in eastern India), with a blouse known as a choli or ravika forming the upper garment. The choli has short sleeves and a low neck and is usually cropped, and as such is particularly well-suited for wear in the sultry South Asian summers. Cholis may be "backless" or of a halter neck style. These styles are usually more dressy, with a lot of embellishments such as mirrors or embroidery, and may be worn on special occasions. Women in the armed forces, when wearing a sari uniform, don a half-sleeve shirt tucked in at the waist. The term "sari" is derived from a Sanskrit word meaning "strip of cloth"
The word 'sari' evolved from the Prakrit sattika, as mentioned in earliest Buddhist and Jain literature. The history of Indian clothing traces the sari back to the Indus valley civilization, which flourished from 2800-1800 B.C.E. The earliest known depiction of the sari in the Indian subcontinent is the statue of an Indus valley priest wearing a drape. Some costume historians believe that the men's dhoti, which is the oldest Indian draped garment, is the forerunner of the sari. They say that until the fourteenth century, the dhoti was worn by both men and women. Sculptures from the Gandhara, Mathura and Gupta schools, from the first through the sixth centuries C.E., show goddesses and dancers wearing what appears to be a dhoti wrap, in the "fishtail" version which covers the legs loosely and then flows into a long, decorative drape in front of the legs. No bodices are shown. Other sources say that everyday costume consisted of a dhoti or lungi (sarong), combined with a breast band and a veil or wrap that could be used to cover the upper body or head. The two-piece Kerala mundum neryathum (mundu, a dhoti or sarong, neryath, a shawl, in Malayalam) is a survival of ancient Indian clothing styles; the one-piece sari is a modern innovation, created by combining the two pieces of the mundum neryathum. The history of the choli, or sari blouse, and the petticoat is a subject of controversy. Some researchers state that these were unknown before the British arrived in India, and that they were introduced to satisfy Victorian ideas of modesty. Previously, women only wore one draped cloth and casually exposed the upper body and breasts. Other historians point to much textual and artistic evidence for various forms of breastband and upper-body shawl which were worn much earlier. In South India, it is indeed documented that women from many communities wore only the sari and exposed the upper part of the body until the twentieth century. Poetic references from works like Shilappadikaram indicate that during the sangam period in ancient South India, a single piece of clothing served as both lower garment and head covering, leaving the bosom and midriff completely uncovered. In Kerala there are many references to women being bare-breasted. including many pictures by Raja Ravi Varma (1848 – 1906). Even today, women in some rural areas do not wear cholis. In the privacy of their homes, even city women sometimes find it convenient and comfortable to drape the sari as a cover-all, without the choli. The most common style of draping a sari is wrapped around the waist and the bust, with one end draped over the shoulder. However, the sari can be draped in several different styles. Some styles require a sari of a particular length or form. 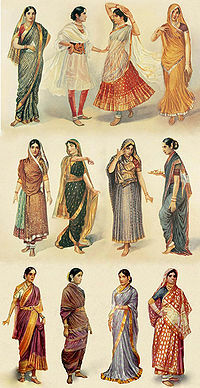 North India: Also described below as the "Modern Style," it is the most common way of wearing a sari (shown in the images below). The sari makes one circle around the waist, pleats, and makes one more half circle, with the loose end or "pallu" going over the left shoulder. The North Indian Style refers to the drape common to Delhi, Uttar Pradesh, Punjab, Haryana, Bihar, Uttrakhand States. In the north, the Pallu may also be draped again over the right shoulder, or over the head and over the right shoulder. This is usually done as a sign of respect for elders. The drape over the head is thought to be a Muslim influence from the intermingling cultures which was more pervasive in the North due to invasions. Nivi (sari drape) – styles originally worn in Tamil Nadu; besides the modern nivi, there is also the kaccha nivi, where the pleats are passed through the legs and tucked into the waist at the back. This allows free movement while covering the legs. Gujarati – this style differs from the nivi only in the manner in which the loose end is handled: in this style, the loose end is draped over the right shoulder rather than the left, and is also draped back-to-front rather than the other way around. Maharashtrian/Kache – This drape (front and back) is very similar to that of the male Maharashtrian dhoti. The center of the sari (held lengthwise) is placed at the center back, the ends are brought forward and tied securely, then the two ends are wrapped around the legs. When worn as a sari, an extra-long cloth is used and the ends are then passed up over the shoulders and the upper body. This style is primarily worn by Brahmin women of Maharashtra, Karnataka, Andhra Pradesh and Tamil Nadu. 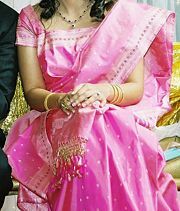 Dravidian – sari drapes worn in Tamil Nadu; some (especially among the Singhalese in Sri Lanka) feature a pinkosu, or pleated rosette, at the waist. the two-piece sari, or mundum neryathum, worn in Kerala. A two-piece sari is usually made of unbleached cotton and decorated with gold or colored stripes and/or borders. Part of the list above is quoted from Chantal Boulanger, French cultural anthropologist, who categorizes sari drapes into a few families. The nivi drape starts with one end of the sari tucked into the waistband of the petticoat. The cloth is wrapped around the lower body once, then hand-gathered into even pleats just below the navel. The pleats are also tucked into the waistband of the petticoat. They create a graceful, decorative effect which poets have likened to the petals of a flower. After one more turn around the waist, the loose end is draped over the shoulder. The loose end is called the pallu or pallav. It is draped diagonally in front of the torso. It is worn across the right hip to over the left shoulder, partly baring the midriff. The navel can be revealed or concealed by the wearer by adjusting the pallu, depending on the social setting in which the sari is being worn. The long end of the pallu hanging from the back of the shoulder is often intricately decorated. Some nivi styles are worn with the pallu draped from the back towards the front. 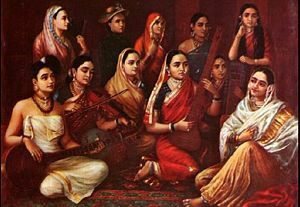 The Nivi saree was popularized through the paintings of Raja Ravi Verma. by modifying the South Indian saree called mundum neriyathum. In one of his paintings, the Indian subcontinent was shown as a mother wearing a flowing nivi saree. In Pakistan, the wearing of saris has almost completely been replaced by the shalwar kameez for everyday wear, though it remains a popular dress for formal functions, especially weddings among the Pakistani elite, and is currently gaining interest. 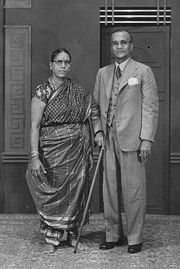 The sari is sometimes worn as daily-wear, mostly in Karachi, by those elderly women who were used to wearing it in pre-partition India. The sari lost popularity in Pakistan, because it was viewed as a Hindu dress. Although she was seen wearing them, Fatima Jinnah, the "Mother of the Nation," called the sari "unpatriotic" and the wife of Pervez Musharraf's wife has stated that she never wears them. Sri Lankan women wear saris in many styles. However, two ways of draping the sari are popular and tend to dominate; the Indian style (classic nivi drape) and the Kandyan style (or osaria in Sinhalese). The Kandyan style is generally more popular in the hill country region of Kandy from which the style gets its name. Though local preferences play a role, most women decide on style depending on personal preference or what is perceived to be most flattering for their figure. The traditional Kandyan (Osaria) style consists of a full blouse which covers the midriff completely, and is partially tucked in at the front as is seen in this nineteenth century portrait. However, modern intermingling of styles has led to most wearers baring the midriff. The final tail of the sari is neatly pleated rather than free-flowing. This is rather similar to the pleated rosette used in the 'Dravidian' style noted earlier in the article. Saris are woven with one plain end (the end that is concealed inside the wrap), two long decorative borders running the length of the sari, and a one- to three- foot section at the other end which continues and elaborates the length-wise decoration. This end is called the pallu; it is the part thrown over the shoulder in the Nivi style of draping. In past times, saris were woven of silk or cotton. The rich could afford finely-woven, diaphanous silk saris that, according to folklore, could be passed through a finger-ring. The poor wore coarsely woven cotton saris. All saris were handwoven and represented a considerable investment of time or money. More expensive saris had elaborate geometric, floral, or figurative ornament created on the loom, as part of the fabric. Sometimes warp and weft threads were tie-dyed and then woven, creating ikat patterns. Sometimes threads of different colors were woven into the base fabric in patterns; an ornamented border, an elaborate pallu, and often, small repeated accents were woven in the cloth itself. These accents are called buttis or bhutties (spellings vary). For fancy saris, these patterns could be woven with gold or silver thread, which is called zari work. Sometimes the saris were further decorated, after weaving, with various sorts of embroidery. Resham work is embroidery done with colored silk thread. Zardozi embroidery uses gold and silver thread and sometimes pearls and precious stones. Cheap modern versions of zardozi use synthetic metallic thread and imitation stones, such as faux pearls and Swarovski crystals. 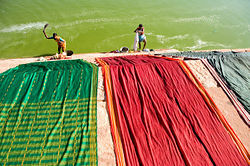 In modern times, saris are increasingly woven on mechanical looms and made of artificial fibers, such as polyester, nylon, or rayon, which do not require starching or ironing. They are printed by machine, or woven in simple patterns made with floats across the back of the sari. This can create an elaborate appearance on the front, while looking ugly on the back. The punchra work is imitated with inexpensive machine-made tassle trim. Hand-woven, hand-decorated saris are naturally much more expensive than the machine imitations. While the over-all market for hand-weaving has plummeted (leading to much distress among Indian hand-weavers), hand-woven saris are still popular for weddings and other grand social occasions. ↑ 1.0 1.1 1.2 1.3 1.4 1.5 Roshen Alkazi, Ancient Indian Costume (South Asia Books, 1985, ISBN 978-0836413342). ↑ 2.0 2.1 2.2 2.3 2.4 G.S. Ghurye, Indian Costume (Bombay: Popular book depot, 1951). ↑ R.P. Mohapatra, Fashion Styles of Ancient India (B.R. Publishing corporation, 1992, ISBN 8170187230). ↑ 4.0 4.1 4.2 4.3 Chantal Boulanger, Saris: An Illustrated Guide to the Indian Art of Draping. (New York: Shakti Press International, ISBN 0966149610). ↑ 5.0 5.1 R. Parthasarathy, The Tale of an Anklet: An Epic of South India, – The Cilappatikaram of Ilanko Atikal, Translations from the Asian Classics (New York, NY: Columbia University Press, 1993, ISBN 0231078498). ↑ Bharata, The Natyashastra [Dramaturgy] (Calcutta: Manisha Granthalaya, 1967). ↑ Brenda Beck, "The Symbolic Merger of Body, Space, and Cosmos in Hindu Tamil Nadu." Contributions to Indian Sociology 10(2) (1976): 213-243. ↑ 8.0 8.1 8.2 Mukulika Banerjee and Daniel Miller, The Sari (Oxford, UK: Berg, 2003, ISBN 1859737323). ↑ 9.0 9.1 9.2 Kamala S. Dongerkery, The Indian Sari (New Delhi: Government of India, 1961). ↑ Sudha Ramachandran, Bollywood, saris and a bombed train. Asia Times, February 23, 2007. Retrieved November 14, 2013. ↑ 11.0 11.1 Ramachandra Guha, The spread of the salwar. The Hindu, October 24, 2004. Retrieved November 14, 2013. ↑ Sunanda K. Datta-Ray, Meanwhile: Unraveling the sari. The New York Times, April 28, 2005. Retrieved November 20, 2013. Beck, Brenda. "The Symbolic Merger of Body, Space, and Cosmos in Hindu Tamil Nadu." Contributions to Indian Sociology 10(2) (1976): 213-43. Bharata. The Natyashastra [Dramaturgy], 2 vols., 2nd. ed. Trans. by Manomohan Ghosh. Calcutta: Manisha Granthalaya, 1967. Ghurye, G.S. Indian Costume. Bombay: Popular book depot, 1951. ASIN B004VJG1WC (Includes rare photographs of 19th century Namboothiri and nair women in ancient saree with bare upper torso). All links retrieved November 14, 2013. A site dedicated to exploring the beauty of the Saree. German sari collection - hundreds of pictures. Sari vs. salwar kameez on the subcontinent. Indian sari falls from grace as urban women adopt Western styles. Care and cleaning of your sari. This page was last modified on 8 April 2014, at 16:09.